We’re a Talk of The Town 2011 Award Winner! 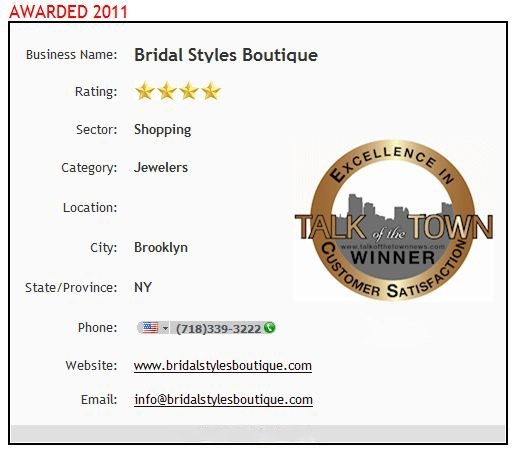 Bridal Styles earned a Talk of the Town award for excellence in customer satisfaction, and we have all our beautiful brides to thank. The businesses honored are chosen for the number of positive customer reviews they’ve received, and it’s a thrill to have earned such accolades from you. Because though we (really, really) adore fabulous bridal accessories, we love our customers more! This entry was posted on Tuesday, October 25th, 2011 at 8:36 am	and is filed under Announcements. You can follow any responses to this entry through the RSS 2.0 feed. You can skip to the end and leave a response. Pinging is currently not allowed.